An easy, all-in-one online publishing tool for businesses & professionals, with payments and community moderation, and some pay-only features. 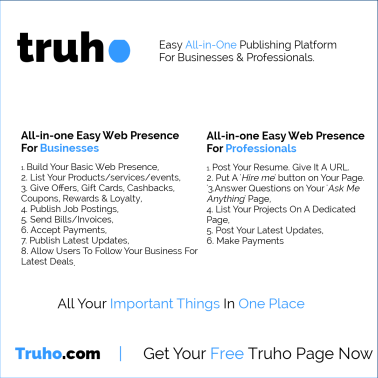 Truho wants to provide everything a business/professional needs to succeed online, in one place. We believe maintaining a comprehensive online business presence should be as easy as using your email/social media account. Just sign up and see how much you can do using Truho. What can I find on Truho? Almost everything. Business listings, products, services, deals/offers, rewards progams, job posting, other business pages, resume, 'hire me' buttons, lead generation pages...and much more. The services involving payments are in 'to be launched soon' mode as Truho tires to find a good payments provider. Please also read: How Truho helps professionals | How Truho helps businesses, big and small. How is Truho different from Blogger, Wordpress or Medium? Great names, these three are (at least two of these). Humbly, the petitioner requests that these are blogging platforms, useful for basic web presence, journals, news and articles...but you need plugins, themes and programmers to configure (in case of Blogger and Wordpress) for your business/professional purposes. That doesn't take away the fact that these are the pioneers in their fields. Who is Truho targeted at? At professionals, giving them a non-spammy (talking about you, Linkedin) place to create their resumes, 'hire me' buttons and more. At new businesses, or businesses with no web presence, who get an all-in-one place to list everything. At established brands (in retail, service and other industries), who get a dedicated place to share their latest offers & deals. They also get people who 'follow' their brands just for deals, so the intent is clear. At everyone selling services, or people with a shop, who get a very simple to use POS (point of sale) style tools, among other simple tools to conduct business online. Truho is free for all professionals. It is free for all businesses too, for the time being. After that, businesses will have to pay nominal fees for posting stuff. What is the origin story of Truho? Since 2009, Pramit Singh wanted to make an multipurpose publishing/payments system, which would be as easy to use as an email/social media account, and which would give people more freedom and options that the centralized behemoths who basically own the internet today. Who would want that sort of thing? Anyway, Pramit launched Truho.com in 2017, eight years after he first thought of it. Pramit Singh, since he could find no one else stupid enough to run this kind of all-in-one thing. What else is Pramit Singh up to? He runs a number of little websites running under The Simple Project umbrella, all on the 'all-in-one' idea. Read this page and find out more about his projects. What languages does Truho support? How many employees does Truho have, and where are its offices located? 6 people manage Truho out of New Delhi, India. How do I report an error on Truho? Please use the feedback page. 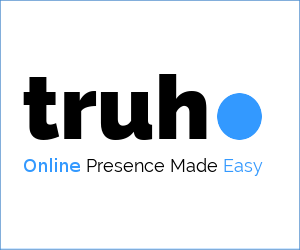 If you want to know more about Truho, the team, or want to be associated with Truho in some way, please use the form, or write to pramitsingh AT truho.com. Thank you for your interest in Truho. Still here? Good. Let's make our world less noisy.